I’ve moved to another set of streets to discover. This time, it is raining, not snowing. The little coffee shops have turned into tinier one-hall-kitchens, the streetlights are dimmer and twilight has vanished into a sultry, soaking heat that reaches the very top of my head. Bombay is a busy, busy town and my children are busier. Working in the field of drama-in-education is opening up new staircases in my mind. Let us see where this one goes. I’ve always loved children. The younger, the better, the more enjoyable to work with. 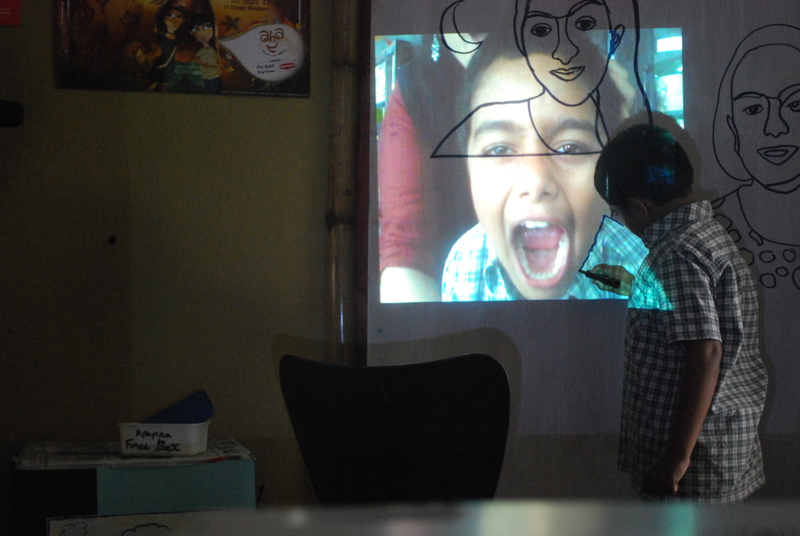 This April, a few parents trusted me when I said, ‘ I want to provide a space for your kids to go crazy on paper!’ And that is what I did- went crazy with them. However, I find it depressing to note how early competition and the competitive spirit is cultivated in children. The good workers are repeatedly rewarded for ‘being good’ and the naughty ones, or the ones less focused are repeatedly scolded for ‘bad behavior’. 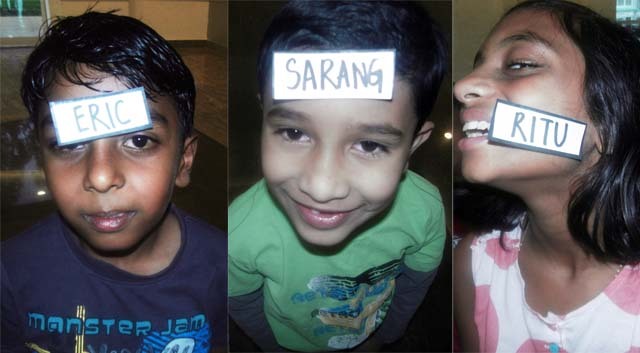 My attempt at conducting an art and drama workshop for young children ( aged 5 to 10 yrs) stemmed off of an Education project I had done at Srishti under the theme of ‘Theatre and Pedagogy’ using Forum Theatre, where the FT structure broke conventional classroom technique and pedagogical structure. 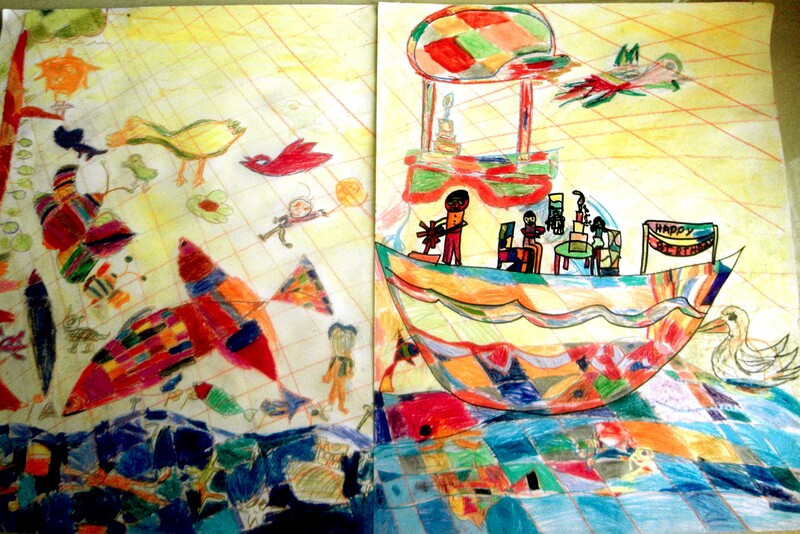 I wanted to find out if I could float a project on my own boat, my own ideas of pedagogy, which are quite different from those that children, even as young as 5 are used to at school. My liberal, self-directed approach with minimal spoon feeding and more space for exploration was recieved with much delight in the beginning. But as the month progressed and functional problems propped up, like the division between the ‘serious art kids’ and the ones there to ‘be naughty’, the questions of ‘whose work is better?’, ‘ Is this beautiful art?’, ‘How can I learn to become the best artist, better than everyone else?’ and so on, it seemed as if the kids were conditioned to hear me punishing the naughty ones, throwing them out of the class and rewarding the one who did the best. One of the ‘good ones’ told me that they were disappointed to see that I had no form of punishment intact for those who distract the class. In the classroom, I want to step way from this notion of good,better and best. I want to see children really using a space for as much independent thinking as possible. It seems, as if, in the Indian context, even in the alternate pedagogical structure, this functioning doesn’t come easy. This mural was developed using the ‘box technique’ of making a rough cross hatch pattern of lines and drawing forms on it. 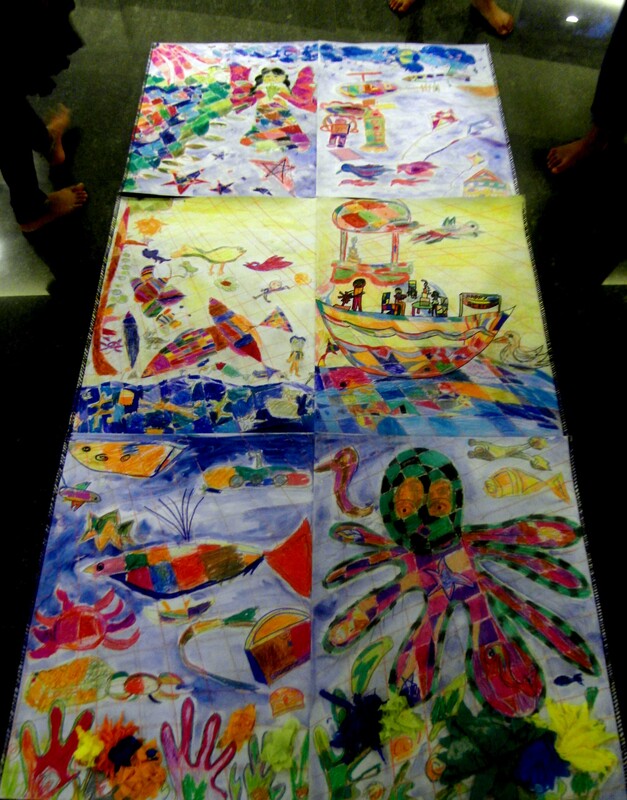 The forms are then made to overlap with other forms and the mural gets divided into small squares or rectangles that each child can colour using different colors, materials and textures. 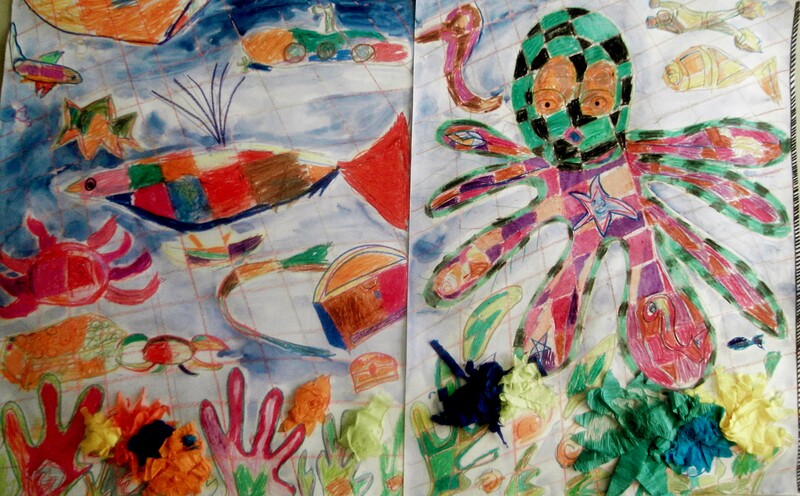 Stories under the sea were visualized. A flower making workshop lead to accessorizing the mini coral reef. 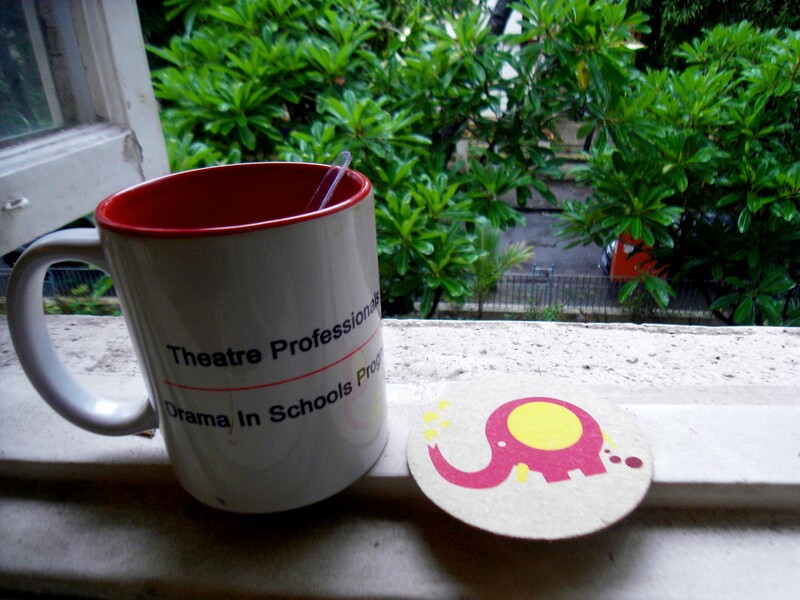 I’m back in Bangalore for a bit and working at the theatre, Ranga Shankara. As part of the AHA! 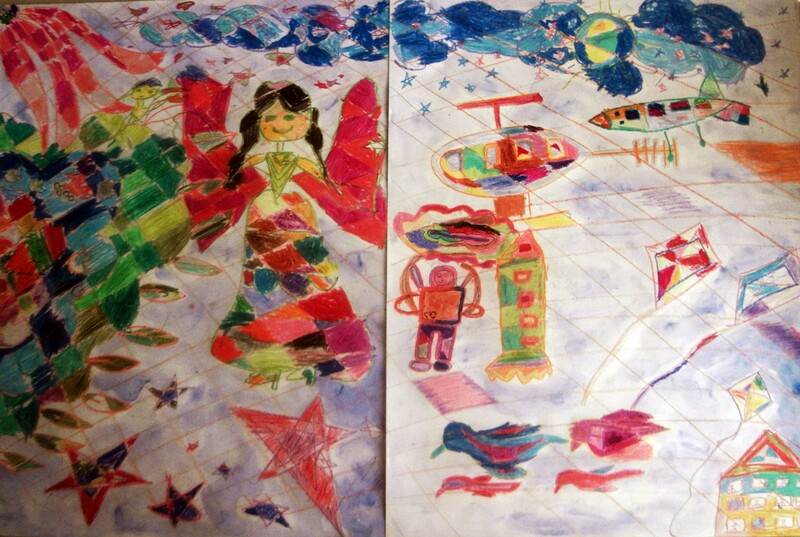 International Theatre for Children Festival’11, I used Arzu Mistry’s mural making technique to facilitate a workshop, making murals with children aged between eight and thirteen. 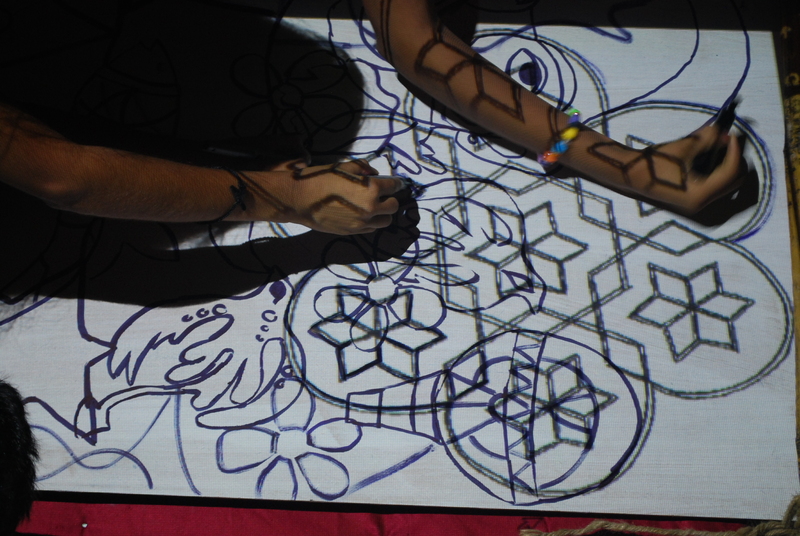 This mural was created using the scaling up and scaling down properties of an overhead projector. 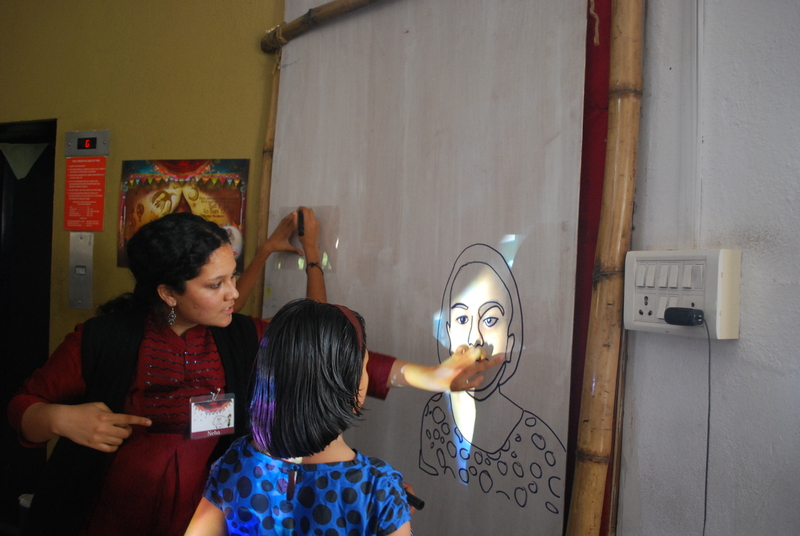 The participants of the workshop were asked to create stencils on transparencies, on themes revolving around the elements of artwork for the AHA! 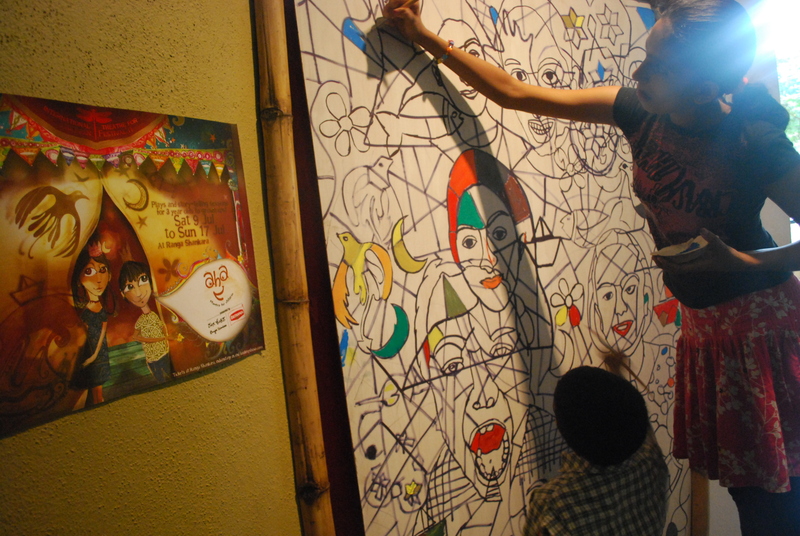 International Theatre for Children Fest’11. 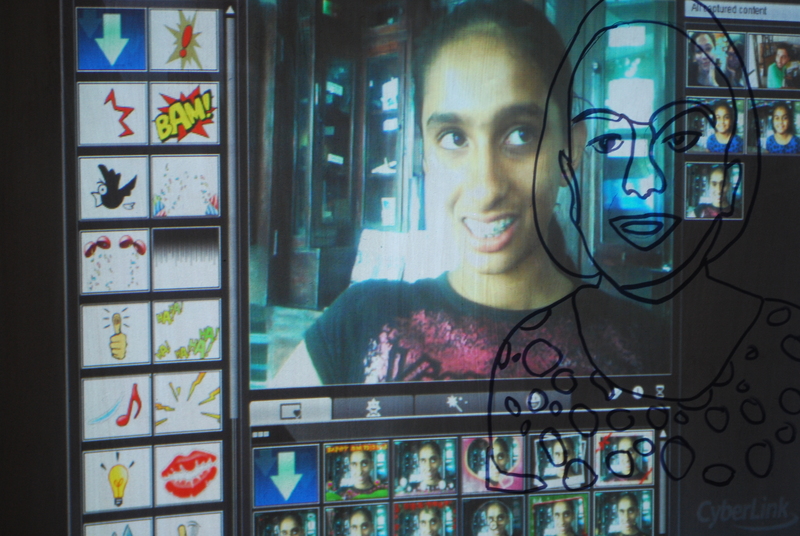 Each participant was made to take their photograph on a webcam, which was connected to a projector and projected onto 9 foot long plywood. The image was then scaled up and down according to the composition visualized.The stencils were also traced and then overlapped to create a composition of black and white shapes. 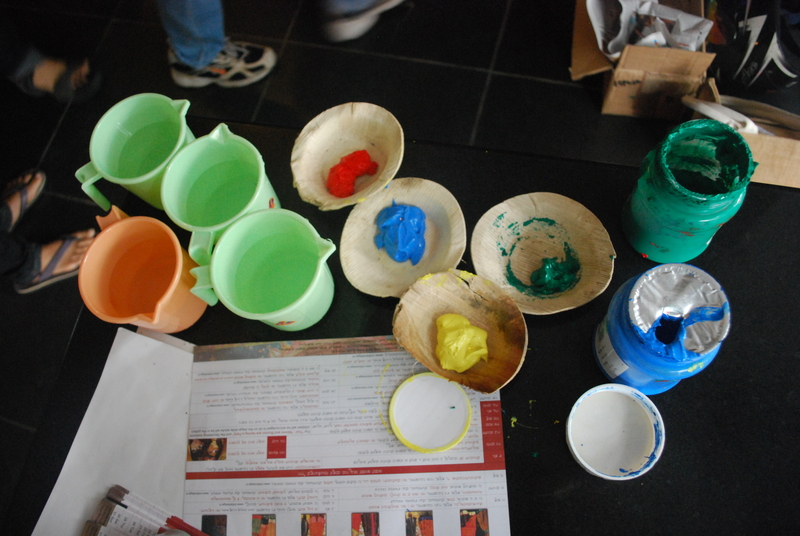 Next, each shape was filled in with a different shade of a particular color. 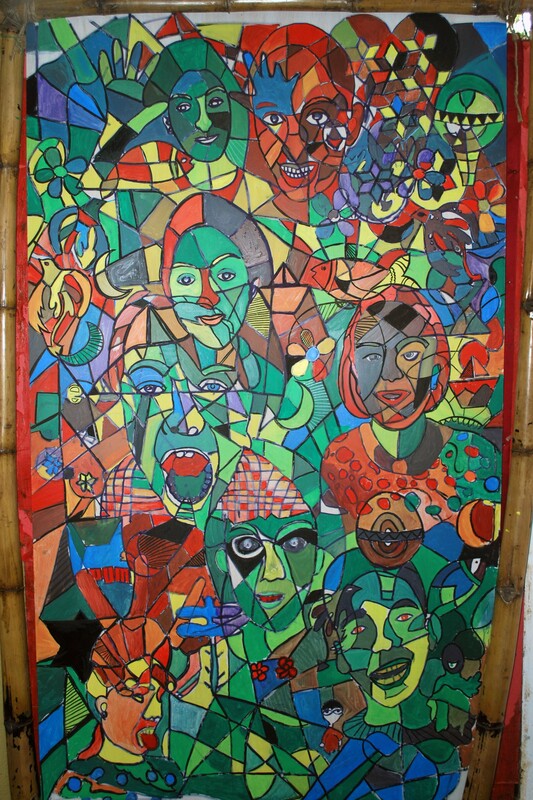 Groups of shapes were demarcated for different color families and this technique was followed to fill in the entire mural. Love creates.I, like most people am on a never ending search for it. 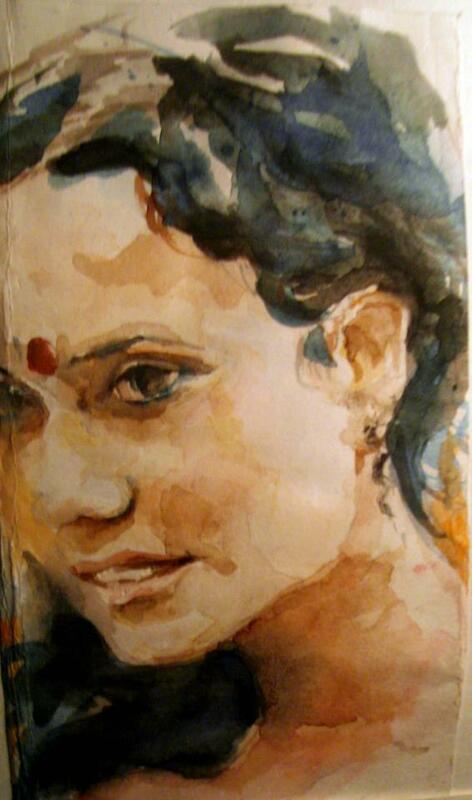 Mostly,its through ‘work’ that I seek it. A desperate search for what gave me the most joy in terms of material and media. Mixed, I discovered. And so, I indulged in the unfailing love of glossy magazine cutouts,watercolour,inks,wax and coloured pencil. Emerged out of my love for spontaneity, a four imperial sized four colour composition. With all my respect to the destroyer of obstacles. For The Vizag Junkie. Out of respect for bird watching, green trees and Hyderabad rocks.